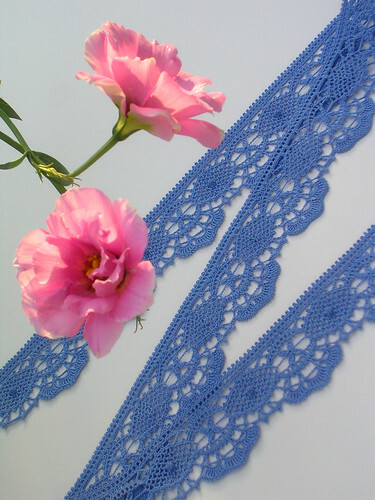 I made this lace in size 30 DMC Cebelia crochet cotton and a size 11/12 steel crochet hook. It is from a Burda pattern. It is a fairly easy pattern done in the round. Since it is worked lengthwise, you only have to look at the pattern when turning at the ends. It has tons of picots, and I love the look of picots. The blooms are lisianthus from my garden. One of my favorite flowers because where I live it will bloom all year. This entry was posted on Monday, October 27th, 2008 at 9:07 am and is filed under Crochet and Lace. Tagged: Crochet, Lace. You can feed this entry. You can leave a response, or trackback from your own site. Beautiful! I need to learn to crochet with thread…. maybe when Angie goes to college. I keep telling myself I’ll have time then.